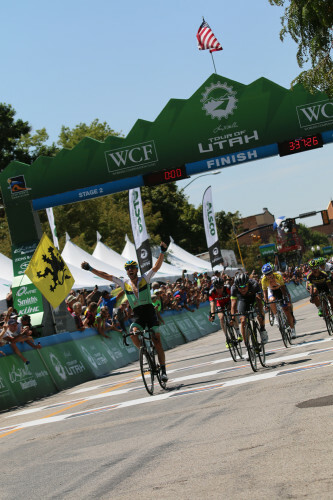 August 4, 2015 – Ogden, Utah – Team SmartStop’s Jure Kocjan (Slovenia) timed his sprint perfectly to win Stage 2 presented by Workers Compensation Fund at the Larry H. Miller Tour of Utah. Emerging from a reduced peloton, Kocjan, who wore the leader's jersey for two stages in last year's race, finished the stage in a time of three hours, 37 minutes and 27 seconds at the finish line on historic 25th Street in Ogden. A bike length separated Kocjan from second-place Robin Carpenter (USA) of Hincapie Racing Team and Brent Bookwalter (USA) of BMC Racing Team in third. “We were really disappointed yesterday. After dinner I just went to my room and stayed there and just thought about today. I was super-motivated and angry and I knew that I had to make it over this climb,”said Kocjan, who was the last rider to make it over the North Ogden Divide with less than 20 miles to go in the stage. “But I made it over and once we came down, I looked back and saw that we had a big gap like 50 seconds. So I just told the guys, my teammates, go as hard as you can. I knew that there were not a lot of good sprinters in the front. I knew that if we made it to the end, I was probably the fastest one,”Kocjan said. Overall race leader Kiel Reijnen (USA) of UnitedHealthcare Pro Cycling Team retained his Larry H. Miller Dealerships Leader’s yellow jersey by finishing fourth on the 100.3-mile stage. Alex Howes (USA) of Cannondale-Garmin Pro Cycling remained second overall tied on time with Kocjan who sits in third place. Carpenter vaulted up to fourth place and takes over the Subaru Best Young Rider jersey. Welcomed blue skies and warm weather greeted the 121 racers at the start of Stage 2 presented by Workers Compensation Fund in the first-time host city Tremonton. After a flurry of attacks at the front early in the stage, Jay Thomson managed to escape solo on a flag-lined road in Thatcher with a chase group bridging up to him 10 miles later. Joining Thomson at the front were Dan Eaton (USA) of Axeon Cycling Team, Pierrick Naud (Canada) of Optum p/b Kelly Benefit Strategies, Ben Jacques-Maynes (USA) of Jamis-Hagens Berman presented by Sutter Home and Mackenzie Brennan (USA) of Hincapie Racing Team. The five-rider break worked together to expand the gap on the wide, rural roads of Box Elder County, including the famous Fruit Highway (Hwy 89) before rolling along the Wasatch Front through Honeyville, Brigham City, Perry and Willard. The UnitedHealthcare Pro Cycling Team controlled the pace at the front of the peloton, holding the gap around the three-minute mark. Thomson took the two Utah Sports Commission Sprint Lines and moved up to fifth place in the general classification with the bonus time. The lone Ski Utah King of the Mountain climb brought a quickening of the pace, reducing the gap to under two minutes on the lower slopes of the North Ogden Divide. The tough 10 percent average gradient proved too much for most of the riders on the break except for Eaton who crested first, and joined by Bookwalter, sped down toward Ogden, averaging close to 60 miles per hour. The field also split up on the climb with most of the sprinters not able to follow the punishing pace. The duo was reeled back by the 46-rider field as they approached the first of three 2.28-mile finishing laps in front of enthusiastic crowds. Attacks flew as no team was able to organize their leadout trains until the bell lap which brought Kocjan's teammate Travis McCabe (USA) to the front. In the final straightway to the finish, McCabe swung out to force Bookwalter to open his sprint early, giving Kocjan a perfect trajectory to the line. Eaton was awarded the Vivint Most Aggressive Rider jersey and fans have chosen Chris Horner (USA) of the Airgas Safeway Cycling Team as the America First Credit Union Fan Favorite. Utah rider Rob Squire (Hincapie), fresh off a victory in the Crusher in the Tushar (see our August issue for the full report), finished in 30th place, but with the same time as the leaders. Park City brothers Tanner and Chris Putt finished 90 and 91st at 5:10 down on the winner. Erik Slack finished in 88th at 2:16 down. The Utah transplant recently joined the Jelly Belly team and made his return to racing after a long break earlier this year. 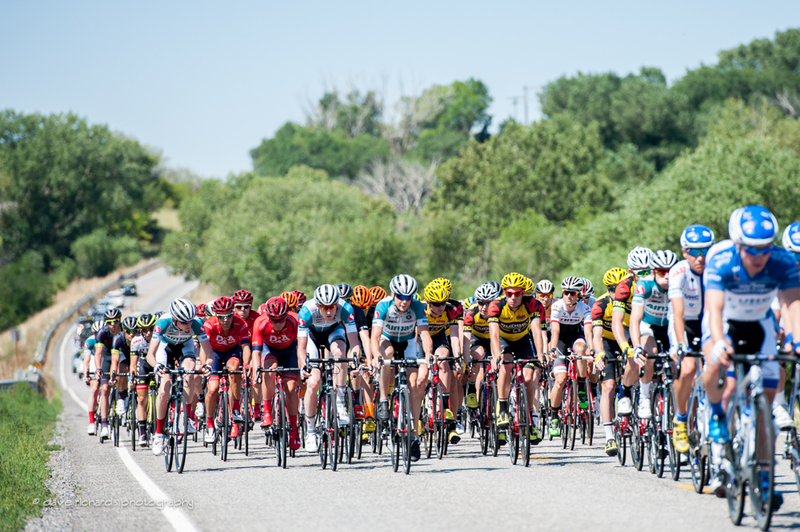 Stage 3 presented by Zions Bank visits Davis County for the first time, including a start at Antelope Island State Park. The 107.9-mile Stage 3 will start at 10:05 a.m. on Wednesday, Aug. 5. After crossing the seven-mile causeway to the mainland, the racers will encounter familiar roads up the North Ogden Divide and the Eden Valley, but this time in a clockwise direction. After racing around Pineview Reservoir, the race will head up Trapper’s Loop in the shadow of Snowbasin Resort. The race will re-enter Davis County and have two nine-mile circuits in Bountiful, which include a difficult climb on 400 North along the Bountiful Bench.